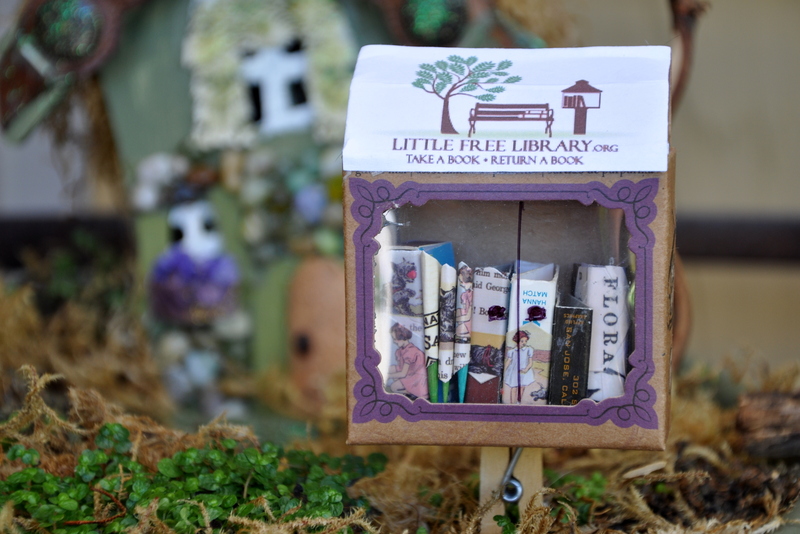 This entry was posted in Fairy Garden and tagged crafting, DIY, fairy garden, fairy garden library, Little Free Library, miniature furniture, Miniature Library Materials, serendipity, whimsy. Bookmark the permalink. What a great image of you enjoying wine at your new home on a warm summer evening. I hope you get a month or two of those lovely, lovely evenings. You gasped! That’s so cool. And you bigified too. Double cool. Thanks for all your lovely words of praise. You make me feel like a million bucks. I’ll bet Alyster would love his own little library. I wonder what his favorite book titles will be? I have heard of yarn bombing. We saw an installation (if you can call it that) here in San Jose several years ago. Aren’t they cool? I never thought of my little flag that way, but not that you mention it, it does look like that. From here on out it will be know as the rainbow, yarn-bombed flag. Love it! I was admiring the clothes peg post and thinking how clever – and it was a clever son’s idea!! Well done!! 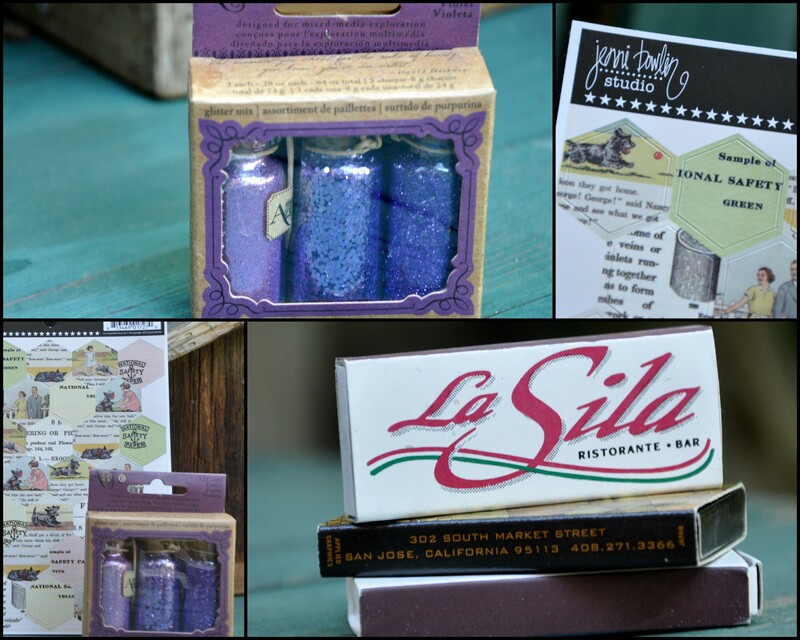 I admire your working in miniature – and the way every day little things are re-purposed. 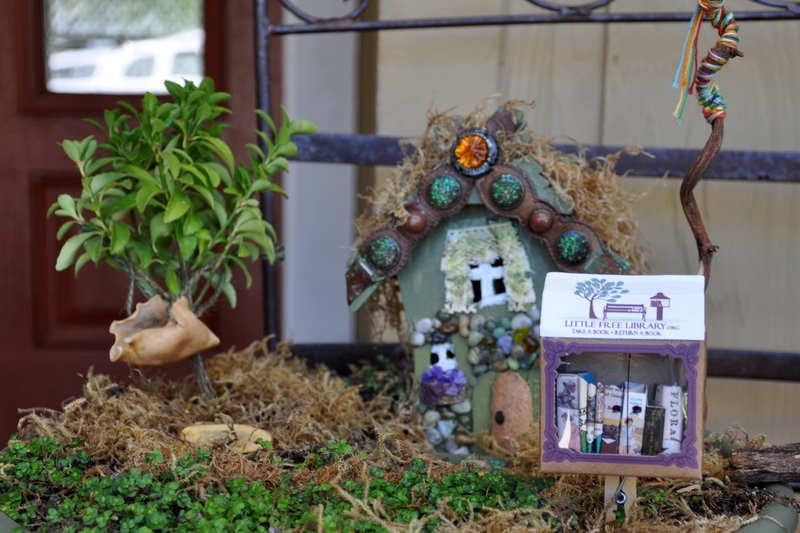 I’m looking forward to the time when I have a reason to create something fairy gardenish again! I hope that time is upon you soon, Pauline, but I know keeping the peace between Orlando and Siddy is at the top of the list right now, along with the creation of your beautiful art and your awesome giveaway. I loved the photo of you on the beach with the little fella. You live in a beautiful place. The time will come – every day we get more creative time. This is a beautiful country – much of it’s beauty comes from the quality of the light. Even in the depths of winter the colours can be seen in shades and hues and faceted light. I missed it very much when I was away. Wow! What a beautiful description of the place you live and love. I hope you’ll write a post about it one day. I would love to hear more. My friend Liz visited New Zealand several years ago, and loved it so much that she’s found a way to stay for much of the year. They bought a house and starting working toward a visa. She’s wonderfully creative (she cooks, gardens, felts, teaches) and found a way to spend more and more time there. If I knew your geography better, I would know if you were in the same area. Though I recall that you are also fond of the north. How I wish the Jetson’s idea of travel had come to pass. Thanks so much, Cathy. I have a great time with my little garden. I make changes whenever the mood strikes. Thank you, Sharon. I’m glad you got to see it in person. That is just too adorable. So creative, Alys. SOoooo so cute!!!!!!! Make a tiny replica of your whole yard!!!! Oh surrrrrrrre…no pressure from you, eh? You go first, and I’ll take notes. That will give me time to build up some stamina, too. I swear I didn’t see this in going through my old posts not yet read. Glad it showed up today. What a wonderful idea and so well executed. I’ll try to get my next post done tonight. Need to move roses today. Last chance. Aren’t you sweet to go back and read from my backlog. I had great fun making that tiny library. I just brought it inside since they are promising (gasp) honest to goodness rain tomorrow. Fingers crossed. Did you get to move your roses? Got the roses moved yesterday while we had a short dry spell. It’s hard to shovel mud. 😦 Cut them way back and will cut back the rest that have not needed to be moved hopefully today or tomorrow. May end up replacing some. Poorly planted. You already have mud!!! Oh my goodness. I hope they survive the move. I’m sure they’re happier in the new place. Come January the nurseries will be full of bare root transplants and you can fill in as needed. That house and garden needed you, Marlene. So glad you’re there.